We’ve been feeling a little blue at deBebians, but only because we have added new, sapphire accented engagement rings to our stunning collection of engagement rings. These rings are just as beautiful as our all diamond engagement rings, but are even more affordable. I have selected a few of my favorite new styles. These new styles will be sprinkled throughout our engagement ring categories, but are also all available on the sapphire engagement ring section. Style # HE118-SBS currently starts at only $830.00 for the 14 karat gold setting. 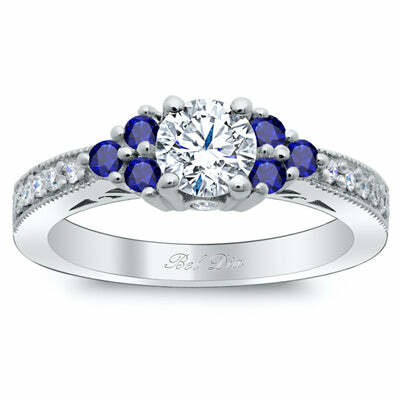 This engagement ring showcases 0.30 cttw of natural blue sapphires set in a u pave band. This engagement ring setting can be set with a myriad of diamond shapes and sizes. 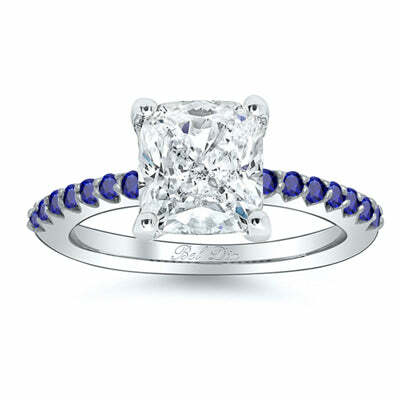 We love this ring because of the versatile 2mm and the vibrant pop of color that the delicate sapphires give the piece. Style # HE248-SBS currently starts at $960.00 for the 14 karat gold setting. 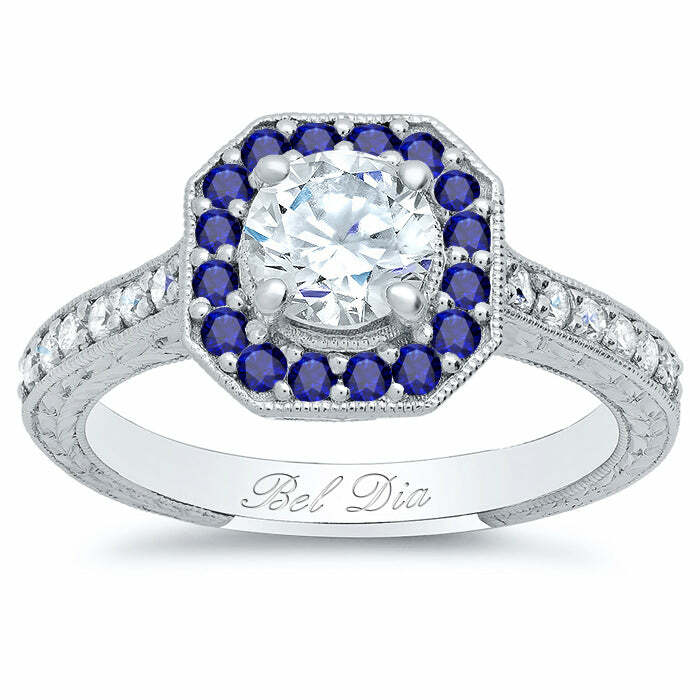 I love the blue sapphire clusters of this Art Deco-inspired engagement ring. The band has milgrain detail and white diamond accents. This piece is visually interesting yet very traditional in its styling, which makes this engagement ring timeless. Style # HT591-SBS currently starts at $1,495.00 for the 14 karat gold setting. A piece that was designed with true vintage inspiration, the blue sapphire halo completes this piece in my opinion. This ring is very reminiscent of antique engagement rings that feature a colored halo, such as Olivia Wilde’s diamond and emerald halo engagement ring. We have many other styles of sapphire accented engagement rings. However, if you would like to customize one of our engagement rings by adding sapphires, please contact one of our jewelry experts or GIA graduate gemologists. We will be able to talk you through the process of creating a unique piece as well as provide you with a custom price quote.